Home » Specials » Just Can It! Harvest time means put up then eat up. At farmers markets and in home gardens across the region, produce is poppin’ at a prodigious rate. Summer’s bounty is the tastiest and most nutritious right now so we’re facing a dilemma: how do we take advantage of it? Seems we have two choices. We could either try to eat everything at once or figure out a way to keep some of it around for eating later. The answer is to preserve the peak of the harvest for later enjoyment. There are five common methods to keep real food on the table for autumn and winter months: drying, salting, canning, freezing and doing nothing. All are easier than you might think and when done well, are far better than buying processed foods in the off-season. Remember, it’s important to pick the freshest, ripest and best food that you can to “put up” for later enjoyment. That starts with a visit to your local farmer or your own garden. With today’s food prices, growing your own is like printing your own money. Drying and Salting Did you know that sushi was originally developed as a method of preserving fish? Nigiri sushi, the kind most of us are familiar with at sushi bars, didn’t come until later. Dehydrating and salting are two methods that work well with animal protein. Jerky is a good example of that. Dehydrating also works very well with produce, too. Solar ovens, commercial dehydrators and often just using the kitchen oven can give you a way to preserve food without refrigeration. A big advantage of dehydration as a method to preserve the harvest is that you can store the results almost anywhere. Dehydrated food is easy to carry, serve and store. Canning: Boiling vs. pressure canning. To demystify the canning process and regain a skill our ancestors used, the first step is to buy a canner. Buy either a boiling water canner or a pressure canner. I recommend a pressure canner because you can do boiling water canning in a pressure canner but you can’t do pressure canning in a boiling water canner. A good pressure canner may cost $50 to $75 but it’s a long-term investment. 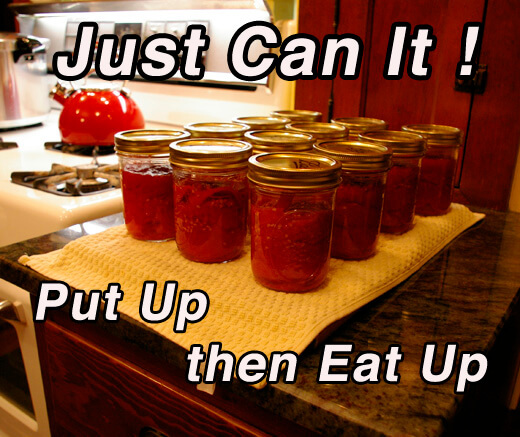 And it will likely come with simple-to-follow canning instructions.